Rhythmic Gymnastics is a discipline performed mostly by women and combining grace, coordination, agility and artistry. It is performed to music with the gymnast using hand apparatus: rope, ball, hoop, clubs or ribbon. Behind the flawless beauty of the sport lies a complex combination of high criteria and firm requirements as to the content of the routines, the degrees of difficulty involved, the technique of handling the apparatus and overall body control. There are two types of competition: one for Individuals and one for Groups (of five gymnasts). Both are Olympic disciplines. The rope may be of hemp or synthetic material. Its length is in proportion to the size of the gymnast. Instead of a handle, each end of the rope terminates in a knot. The technical elements can be performed with the rope open or folded, held with one or both hands, with or without the rope changing hands. The relationship between the apparatus and the gymnast may evoke an aggressive image, as when the rope takes hold of the gymnast and wraps itself around her. But flexibility, agility, and gracefulness will always transcend this moment of "fury". The hoop may be of wood or plastic. Its interior diameter is from 80 to 90 centimetres; its minimum weight is 300 grams. It must be rigid enough to retain its shape. 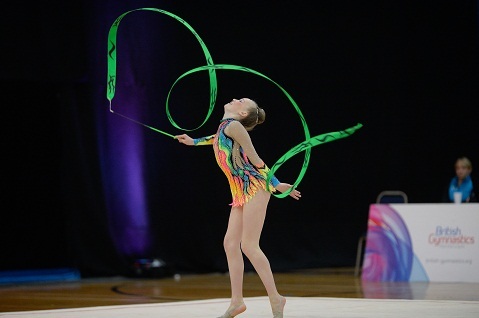 The hoop carves a space that must be fully used by the gymnast, as when she passes through the hoop or when the apparatus rotates around any part of her body. The frequent grip changes in the handling of the apparatus require strong coordination skills. The shape of the hoop is ideal for rolling and rotating the apparatus on the floor or on different parts of the body as well as for passing over or through it. The ball may be made of rubber or synthetic material. Its diameter is between 18 and 20 centimetres, and its minimum weight is 400 grams. The ball is the only apparatus that can never be held physically but only balanced on a part of the body or rolled over it. The result is a perfect symbiosis and a more sensuous relationship between body and apparatus. The spectacular, forceful throws are in neat contrast with the softness and precision of the catches. The clubs may be made of wood or synthetic material. Their length is between 40 and 50 centimetres. Each club weighs 150 grams. Clubs are hand games! The gymnasts perform mills, rotations, circles, throws, and many asymmetric movements in combination with various fundamental body movements. Club handling requires rhythmic work, psychomotor coordination, and clockwork precision. Clubs are especially popular with ambidextrous gymnasts. The stick has a 1 cm diameter and a length from 50 to 60 centimetres. It is usually made of wood, bamboo, plastic or fibre-glass. Most often the ribbon is made of satin or a similar material without starch. Its maximum weight is 35 grams, its width from 4 to 6 centimetres, and its length 6 meters at the minimum. This flexible, long, and light apparatus shapes patterns in space. Its aerial movements carve forms and images. The elements are performed in various amplitudes and rhythms. Snakes, spirals and throws represent the main elements in the use of the ribbon.